This durable 16 oz bottle holds your favorite detailing chemicals and products, and it comes equipped with the upgraded Chemical Resistant Professional Sprayer Head. This upgraded sprayer has an ergonomic comfort grip and extra large trigger handle for comfortable usage during any long detailing job. Every pull from the Heavy Duty Sprayer pumps out 1.3 ml per stroke, over 40% more than stock sprayer heads. More product per spray means fewer pumps and less fatigue with your hands and wrists as you detail. Viton seals resist wear and tear from even the toughest detailing chemicals, and helps prolong the lifespan of these heavy duty sprayer heads. Mobile detailing professionals travel away from their home base to detail their customers ' cars, and running out of product while on the road can have disastrous consequences! The Chemical Resistant Heavy Duty Bottle is made from chemical-resistant clear plastic for easy product identification and level checking. Never leave for a mobile detail with a half-full bottle again! These professional-grade bottles and sprayers stand up to heavy duty detailing use so you can get the job done quickly and efficiently. Take on any detailing job with the confidence of a sprayer bottle that 'll never quit: The Chemical Guys Chemical Resistant Heavy Duty Bottle & Sprayer. Chemical Guys introduced the Chemical Resistant Heavy Duty Bottle & Sprayer to stand up to intense detailing use. Industrial chemicals and professional detailing products are not always chemically neutral. Some products have to be slightly acidic or basic to deliver desired results. The Viton seals in the professional grade sprayer head won 't break down from use with any Chemical Guys product, and help ensure the sprayer system lasts for years of dependable use. Even the clear and durable 16 oz clear plastic bottle resists the wear and tear caused from intensely-caustic detailing cleaners and degreasers. 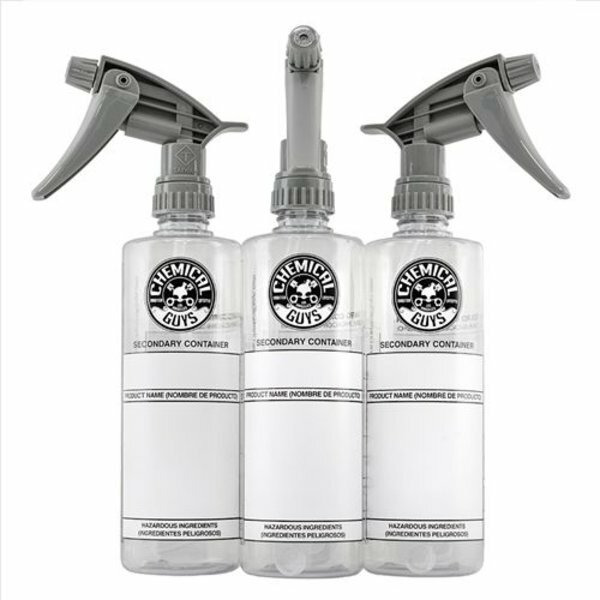 Fill the Chemical Resistant Heavy Duty Bottle & Sprayer with your favorite Chemical Guys all purpose cleaner, heavy duty degreaser, quick detailing spray, spray wax, window cleaner, or even fragrant air freshener & odor eliminator for fast, efficient, and chemical-resistant detailing usage on any job. Ever reached for a sprayer bottle only to find it was empty? A minor inconvenience when detailing in your own driveway, a major crises if detailing for a customer at their location. Fleet managers and shop foremen pick products like the Chemical Resistant Heavy Duty Bottle & Sprayer because they are clear, and easy to check. Just a quick glance at the Chemical Resistant Bottle & Sprayer gives a clear indication of which product is inside, and how much of it is left. Never leave for a mobile detailing job with an empty product again! Never confuse yourself between a heavy duty orange degreaser, a clear all-purpose cleaner, and a bright green window cleaner again! Clear bottles are a good idea, and the Chemical Resistant Heavy Duty Bottle & Sprayer cover every part of the detailing process without compromise or risk of running empty in the middle of a job. Another trait professionals value in the tools they choose is versatility. If one product can do many jobs well, it is usually a better investment than one that cannot. The Chemical Resistant Heavy Duty Bottle & Sprayer is fully-adjustable and can be set up for type of detailing, cleaning, or sanitation job in, around, and outside the car, home, office, and garden. Spray a fine mist of waterless car wash or quick detail spray for maximum coverage with minimum product. Focus the sprayer beam to clean inaccessible wheel and engine bay parts, or water hard to reach potted plants up on a shelf. The Chemical Resistant Heavy Duty Bottle & Sprayer comes with a clear bottle. Write on it, put a label on it, or leave it blank so the competition doesn 't know what magic potion you 're using to get those amazing results! The possibilities are practically endless! Don 't change your detailing techniques and jobs to suit your tools: choose the tools that perform where and how you need them. Choose Chemical Guys Chemical Resistant Heavy Duty Bottle & Sprayers, and take on any detailing job anywhere, any time.